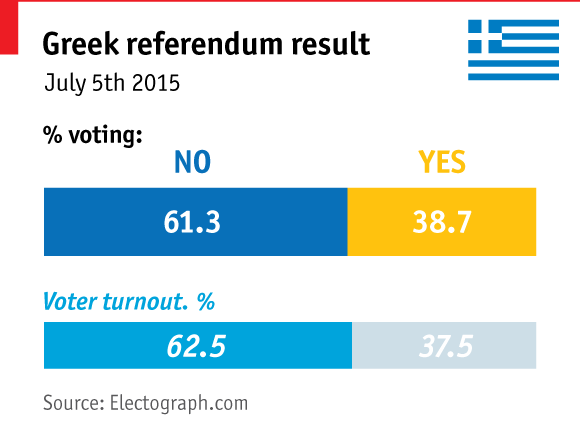 WHY did the Greeks vote no? “Because we are tired of everything, from all the lies, from paying for the rich, and from years of austerity, especially for young”, answers Dora, a young Athenian waving a big Greek flag as she celebrates the “No” victory on Syntagma Square with her friends. Greek people have spoken. 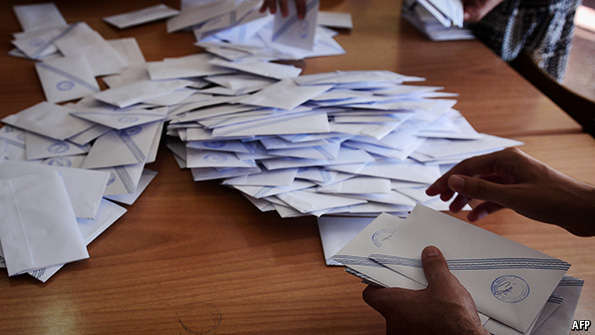 With over 90% of the vote counted, more than 61% of ballots have been cast for “Oxi” (No) in a controversial last-minute referendum that has divided the country into two over the past week. The none-too-clear, 72-word question put to Greeks asked whether they accepted a (since-expired) deal proposed by their European creditors. Some have interpreted this as a vote on bail-out terms; others say it is ultimately a vote on Greece’s membership of the euro, and even of the European Union. What now follows is a standoff between the Greek negotiators and their European creditors. One side must give critical ground if a last-minute deal is to be brokered. To some extent Greece’s hand looks better than it did a day ago. The resounding victory for the Oxi camp might just about give Alexis Tsipras, Greece’s prime minister, the bargaining power he promised voters. A strong “no” tells creditors that it is not simply an intransigent government blocking a deal. On the other hand, Greece has precious little time. All eyes will now turn to a looming series of crucial meetings. Officials at the European Central Bank (ECB) will meet on Monday morning. The ECB will almost certainly want to wait for a direct political signal before pulling the rug from beneath Greek banks. But inaction is dangerous enough. In the absence of new emergency lending from the ECB, several Greek banks could face insolvency this week. Meanwhile, on Tuesday, Eurogroup leaders will meet to decide whether to resume negotiations. They could instead stick to their hard line; some European leaders did their best before the referendum to cast the vote as a choice between continued euro-area membership or “Grexit”. It is not yet clear who has called whose bluff. But the most pressing question concerns the fate of Greek banks. The ECB’s emergency-lending activity has been capped for a full week. With a resounding no vote having come through, nervous Greeks will probably pull as much cash as capital controls allow from their accounts. The banks are expected to run out of cash by the middle of the week, if not sooner, and are in such a fragile state that a collapse cannot be far off. Collapse would probably mean the issuance of a national currency to make depositors whole, and that, in turn, might mean the beginning of the end of Greece’s euro membership. That is a worrying prospect. But there may now be too much bad blood coursing across Europe to avoid anything but the ugliest outcomes.